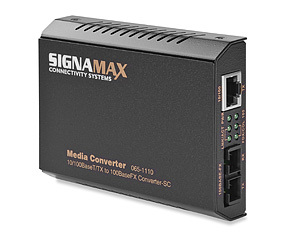 The Signamax 10/100 to 100FX Media Converters with Link Fault Signaling provides the means for an SNMP managed switch to recognize a failure on a fiber channel or twisted-pair connection, enabling the switch to automatically route to a backup path if the connected switch is equipped with Spanning Tree Algorithm. This intelligence maximizes the power of managed switches and enables fail-safe design solutions for complex networks. These converters also extend the maximum singlemode fiber distance, spanning over 46 miles with certain options. 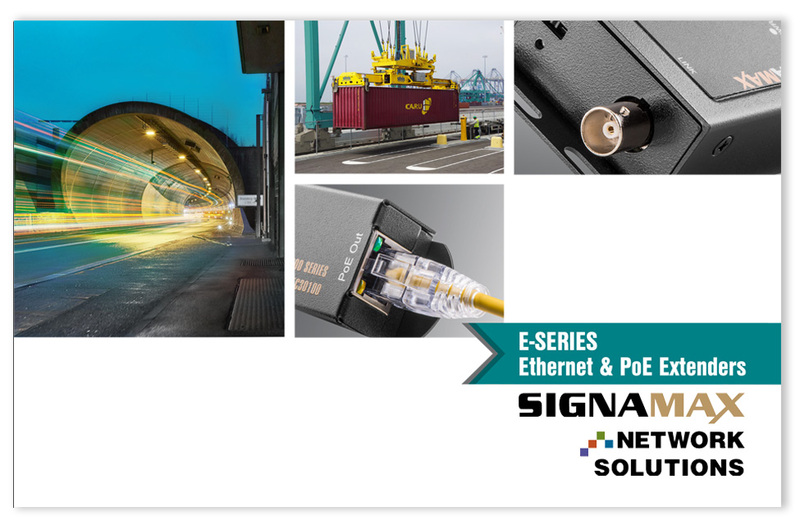 The built-in 10/100 switch enables the fiber cable connection to operate at 100 Mbps connected to either a 10BaseT or a 100BaseTX network, while remaining completely 100BaseFX standard-compliant. Fiber connection can also operate in full duplex mode whether the RJ-45 port is connected to a full duplex switch or a half duplex hub, with the built-in switch providing the network segmentation that permits the maximum fiber distance. 12 V DC. External 100 – 240 V AC 50/60 Hz. Power supply included.